At St. Dominic Parish, we are heirs to a rich history and tradition of Catholic worship, preaching and spirituality. Not only is our parish one of the founding parishes of the Catholic Archdiocese of Denver and the Dominican Province of St. Albert the great, but we also claim affiliation with the international Dominican Order that enjoys nearly 800 uninterrupted years of evangelical preaching. When the Dominican Friars (Officially: Friars of the Order of Preachers) came to Denver before 1889, there was no thought of starting a new parish much less building a new church building. Rather, those early Friars came to Denver for the sunshine and mountain air, which was thought to be a sure cure for various respiratory ailments of the late 19th century. When Father J.T. Murphy arrived, plans were set in motion and the foundations of what would become St. Dominic Catholic Church were firmly established. From our earliest days till today, we have been a neighborhood Church of immigrants. It was the Irish that built the Church’s foundations and the Italian who came quickly behind. In the early 1970s, we took on a Mexican flavor and with the turn of the century we are quickly becoming a reflection of our diverse neighborhood community. On October 6, 1889, Dominican Fr. Joseph T. Murphy celebrated the first Mass of St. Dominic Parish, in a rented feed store on the corner of 25th and Decatur. A list survives of the 28 who attended that Mass. Our neighborhood was a separate township, then called Highlands. Soon it would be part of Denver. 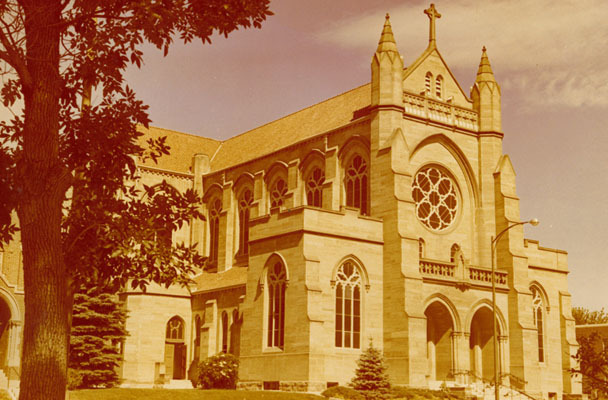 The history of the parish began, a history that keeps pace with the development of the city of Denver, and with the frontier American Catholic spirit, fabricating traditions, building memories on the strong foundation of faith, family and fellowship. The Second World War saw many parish men go off to fight, and not a few gave their lives in battle. (The Holy Name Honor Roll from the war is displayed in the Church.) During the pastorate of Fr. Vincent Reginald Hughes, many improvements were made to the church plant, e.g. the ramp on the north entrance, but by the far the most significant contribution of his time of service came from his associate pastor Fr. Tom McGlynn. Trained as an artist and sculptor, Fr. Tom was commissioned in 1945 to carve a Crucifix as a memorial to parishioners who had served in the war. Within three months the work evolved from sketch to pine blocks to carved masterpiece. Unveiled on Christmas Eve that year it was dedicated on Epiphany, 1946. It remains a legacy of lasting beauty and significance – a sermon preached in pine with hammer and chisel, that speaks to hearts today with the same power it did 45 years ago. The first rectory still stands, an empty shell on Federal near 25th. 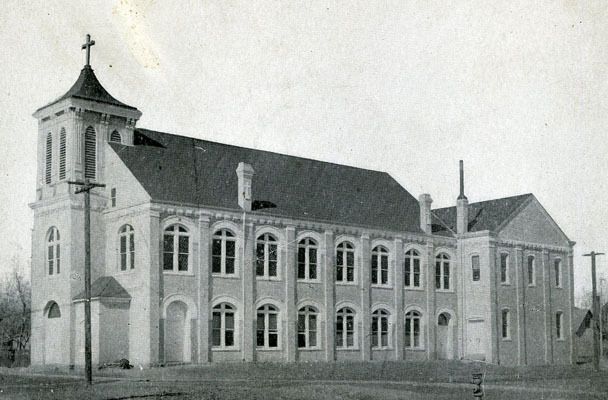 Within a year of its founding the parish built itself the first church, on 25th and Grove — a two-story brick structure with ground floor schoolrooms, and the church as the second floor. The parish saw education of its children as the first task of the parish, and its building symbolized this value. Very soon, in 1890, four Dominican Sisters from Sinsinawa, Wisconsin, arrived to begin the school. These beautiful, generous religious women have been a key part of parish life ever since. Two convents came to be occupied by the sisters. The structures still survive on 25th between Federal and Grove, one for the sick sisters, sent to Denver from many places to try to recover from tubercular diseases, and the other, the “well house” for the school faculty. Many a Dominican sister lived, worked, prayed and died in the parish, and await the resurrection in their special plot at Mt. Olivet Cemetery. The Dominican Friars who served as pastors the first decades of the parish’s existence had something clearly in common: Donnelly, Murphy, Logan, O’Sullivan, Horrigan and Dinahan… they were loved by the Irish railroad workers who lived here, and came too to be loved by the German and Italians in their parish. There were hard times after the turn of the century but this didn’t stop Fr. Brockbank from building an addition on to the back of the church/school complex, which added more classrooms and a hall. Surviving parish bulletins evidence the economic struggles of the parishioners, and chronicle too the deadly toll of one influenza epidemic after the other. During one February, ten parishioners died of the disease: men, women and children. Nonetheless, families grew – in size, in grace and in the love of their Catholic community, their parish. Fr. Peter O’Brien built a new school in 1951, just to the north of the church and filled it with eager students. The annuals of the Parent Teacher Association bulge with the full parish life of those times, still centered around the life and education of our children. Fr. Forquer’s gentle way led the community in the middle 50’s. He was succeeded by Fr. Pat Roney, a preacher from the old school, a musician too, who remodeled the sanctuary and added the backdrop and the woodwork which we presently see. Fr. Michael McNicholas succeeded Fr. Roney and decided the parish needed a secretary. Mrs. Eleanor Zahn was the choice for this role and spent over 25 years in the position. A new convent was proposed and built on 29th and grove by Fr. McNicholas. His sudden illness and death while still pastor saddened the parish deeply. Fr. P.B.Doyle, in 1915, with hope and courage began to plan for the future. He began a building fund for the new church, yet only a dream, but it is dreams that build places like this. He advertised for a cook and housekeeper. Olive Mary Deloughry answered the ad. “Ollie” stayed as housekeeper, meal-planner, cook, laundress, nurse and family to the Dominican community for the next 58 years. Fr. R.F.Larpenteur carried on the dream and through many difficulties: rejection of a first church plan by Dominican superiors, construction problems — the basement kept filling with water — and finally financial troubles. After much pleading for pledges to be fulfilled, he saw the successful completion of the rectory in 1923. Finally, our present grand church was dedicated in February 1926. It is of Cathedral proportions – 165 feet long, 85 feet wide, and 80 feet to the rooftop of this English Gothic church. It is made of gray and buff colored stone from Monte Vista and Boise. It was, and still is, a fitting expression of the nobility, the grandeur and the deep spirituality of the humble people of this parish. The school continued in the old building, but the community gathered in this beautiful place to sing its praise to the One who had blessed them with prosperity. In the face of a rising swell of anti-Catholic Klan sentiment, which blocked their lives in many ways, the people of the parish began their own Credit Union in 1933, which survived as one of the oldest of its kind in Colorado. Parishioners during the hard times of the depression built for their priests and brothers a log cabin as a place for rest and prayer on the side of a hill overlooking Nederland, in Boulder county. The people of that village benefited from the Dominican presence there, and, for years, the chapel of St. Rita’s in Nederland was served as a mission by the priests of St. Dominic. Father Carroll, Father Regan and Father Farrell served as pastors until the outbreak of the Second World War. Parish life was rich. The school prospered. There was always a Drama Club for the young adults, which put on plays for everyone’s enjoyment. Sports were important and so was scouting. The 1960’s were a time of church change, and, with change, came turmoil and dramatic statements even by the leaders. Fr. Leuer left his role as pastor and the priesthood in 1969. There were others too, energetic and beloved young parish associates who in championing controversial and disturbing causes — anti-war protests, migrant worker issues — chose too to leave the priesthood from St. Dominic’s. The task Fr. Bob Miller had to face was to re-establish pastoral credibility and leadership in an age when tensions ran high. Moreover, the population of the parish was changing. There were fewer children for school, higher costs of education, fewer sisters as faculty and mounting deficits in the school budget. In 1973 a painful decision was made to close the parish school. For the first time, St. Dominic’s would face its vocation to teach, to bless, and to heal, without the parish school as its foundational ministry. Under Fr. Kevin Thissen a successful parish family program engaged key family groups into dedicated involvement to the community, which remains strong. His interest in Social Justice causes led him to be one of the founding members of MOP, the Metropolitan Organizations for People. He also did a wonderful job seeing to it that the church recovered from the fire in 1983. Under Fr. José Santiago the Hispanic community’s identity was strengthened and under Fr. Dennis Woerter the new elevator was installed in the church. Sunday 7:30 a.m., 9:30 a.m.
Saturday 3:00 - 4:00 p.m.
Sunday 11:00 - 11:45 p.m.